Alligators eat primarily turtles, fish, snakes and small mammals that are plentiful in the freshwater areas where they live. 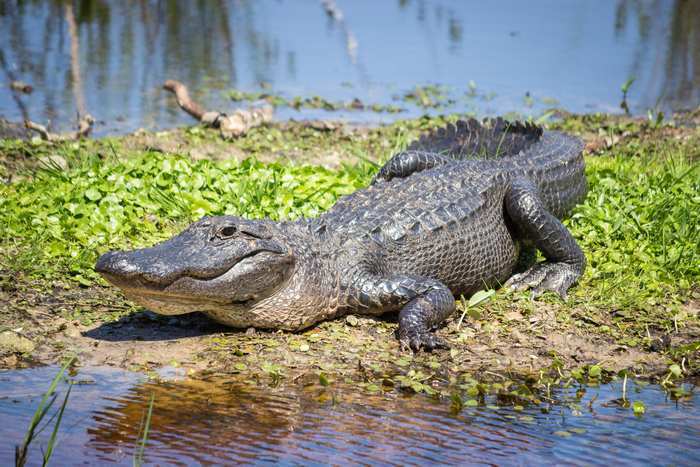 Alligators are powerful and opportunistic predators, and they will eat anything they can catch, including pets and humans, if the opportunity arises and the alligator is hungry. Young alligators generally will eat small fish, snails, crustaceans and worms. As they grow, so do their nutrition needs and the size of their prey. An adult alligator feeds upon various fish, birds and mammals that share its habitat, including dogs, deer, panther and carrion. Alligators do not see humans as prey but have been documented to attack if prey is scarce or if the alligator feels threatened.